Here are testimonials posted from tourists who have visited Kansai district and used our Free Guide service. Thank you! We had a lovely time with Akihiro. 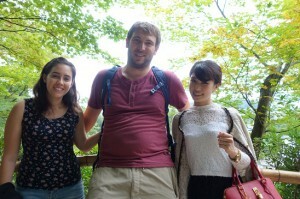 He was able to guide us around Kyoto, Nara and Osaka over 2 days. He was very friendly and accommodating especially for my parents as they were not used to so much walking. We were very lucky to be in Kyoto during the Gion Festival and Aki made sure we had the best vantage point to watch the floats which was amazing to see. Without him we would have been completely lost as there was many closed exits and detours. We went to the many famous landmarks of Kyoto in the Arashiyama area then to the Nishiki Market where he was able to explain and point out the many produce on offer. 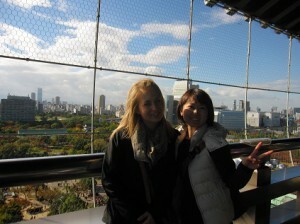 The next day we went to Osaka Castle and the Kuromon Markets then to Nara. We covered off many must see places in 2 days and Aki planned out all the bus and rail connections so everything was perfectly timed. 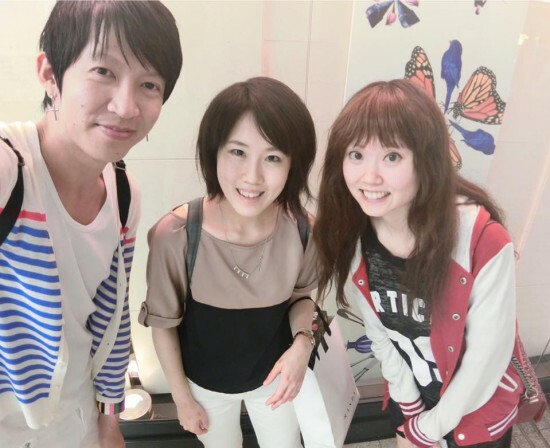 We had Misa Takada as our guide for a day in Osaka. 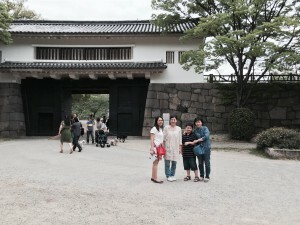 She kindly met us in the morning to start our day by first visiting Osaka castle. She provided detailed historical facts about the shoguns who inhabited the castle and the wars that ensued. As per our early request, we asked to also have lunch at a traditional okonomiyaki restaurant. Misa researched and made arrangements for an okonomiyaki restaurant in Nippombashi which was delicious! 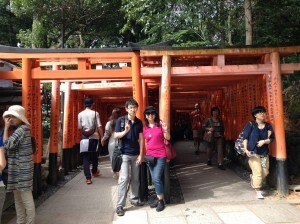 Next on our itinerary was to visit the Sumiyoshi taisha shrine with the famous wooden bridge. But first, we stopped by for dessert. At the shrine, Misa gave us a historical explanation on the history of the shrine, along with the proper instructions on how to pray. Afterwards she took us to a nearby shrine with a wishing stone. I also requested a place to take a purikura together and Misa led us to Namba parks. It is a large mall which where we first had another dessert because we found a Gudetama pop up cafe. It was a very cute cafe and delicious desserts. We took purikura photos at the Namco store. 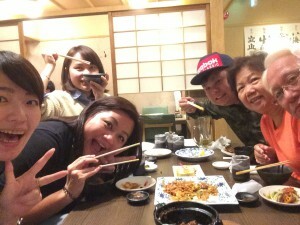 Next, we ate izakaya for dinner at a popular restaurant recommended by Misa in Namba. Food was unique and absolutely delicious. Misa knows her food well! Finally as the evening is drawing to a close, our last request was a visit to Dotonbori for pictures in front of the Glico man, as well as some shopping at Shinsaibashi. After this, we ducked to another cafe for last desserts. We finally said good bye to Misa after a long day of sight seeing and food. We appreciate Misa very much for her assistance and research prior to this day. 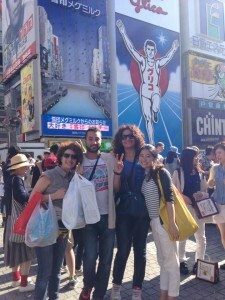 We are saddened to leave Osaka but we are happy to walk away with a friend like Misa. 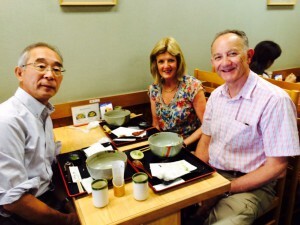 We hope to keep in touch with Misa if ever we visit Japan again, or if she visits Australia. Aki is the perfect sample for all that Japan represents. I was in Japan for 7 days and was amazed to see how wonderfully courteous and gentle Japanese people are. 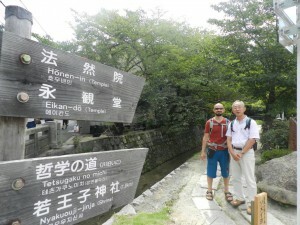 Aki is a wonderful guide, knowledgeable, and a real gentleman. 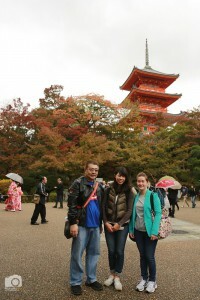 We were in Kyoto for one day but he helped us plan the itinerary so we could cover most of Kyoto. 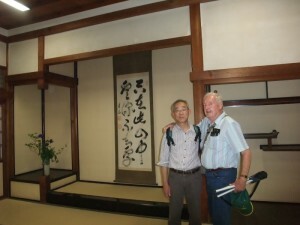 He was tireless and helpful in every way with his rich knowledge about Japan. 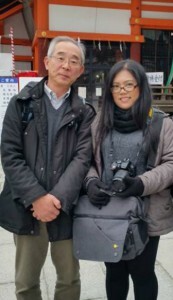 Before we arrived I asked him whether it would be possible for him to find my Schooldays pen friend from Hiroshima whom I had no connection for 44 years. I sent him a photo taken years back in Sri Lanka when my pen friend visited me with his parents address. 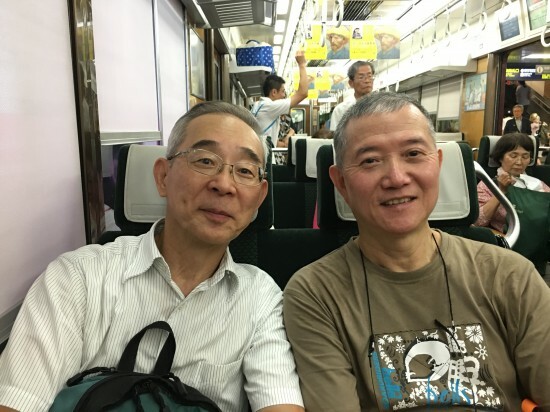 Believe me Aki had not only located him, but arranged us to meet in Hiroshima. I am thankful to him for everything and wish him well in his life. 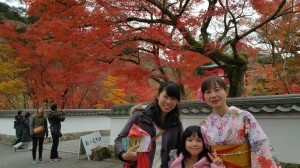 Makiko was an excellent guide on our visit to Kyoto. We greeted us with wonderful gifts made by their children. 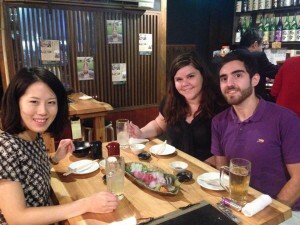 In a fluid Spanish he gave us many explanations of Japanese customs and the places we visited with her. 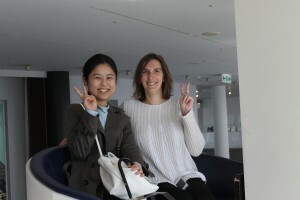 Let me first thank you, Aki and all the people working with you to offer this wonderful service of volunteer guide! We had a great time with Mr. Aki. 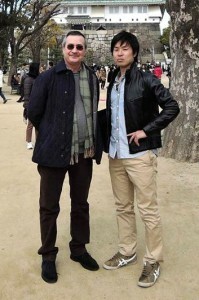 Thank you Mr. Aki, you are an excellent guide. Before we arrived he emailed us asking what we were interested in seeing and he prepared a wonderful itinerary for the day which was great. He met us at the passenger Terminal at 10.0 0am and was with us until 5.00pm. Let me first thank you, Aki and all the people working with you to offer this wonderful service of volunteer guide! Aki was very nice indeed! He prepared a very detailed itinerary for our day in Kyoto after asking me via mail what we would have liked to do and visit. He agreed to make an early start (we met at 7.45a.m.) and stayed with us till 21.00p.m. to come with us to see He answered all the questions we made and was a very pleasant company all day! 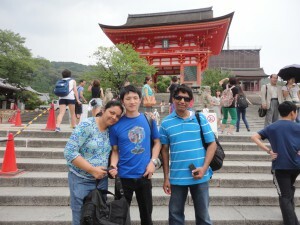 Aki prepared our visit very well in detail, following our wishes and made good suggestions. He was also very patient when we took our time admiring the beautiful Zen gardens or the Golden Pagoda. 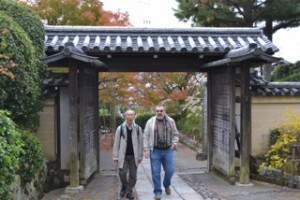 We made good memories in Kyoto and Nara with Aki-san who guided us all throughout the trip. Even before that, he communicated with me and considered all our requests. After that, he prepared a detailed itinerary for us. He’s very kind, patient and enjoyable to be with. He also told us some details and history of the places we visited. 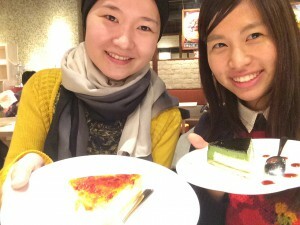 I had the most lovely time with Yukiko! Thank you for introducing us. 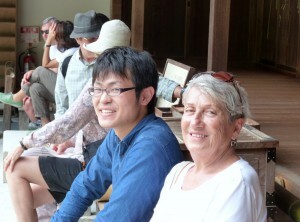 Kento was an excellent guide. He was very proactive in terms of communicating and made sure he understood exactly what I was looking for out of my visit. During the day he was very accommodating to my wishes. He met me at my local train station in Osaka and made sure I got back at the end of the day. 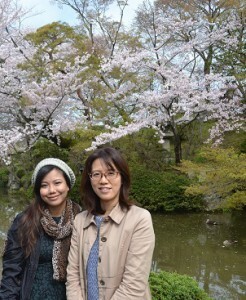 Ms Hiko arrived on time to guide us during our Osaka visit. She speaks fluent English and we have no problem in communicating with her. 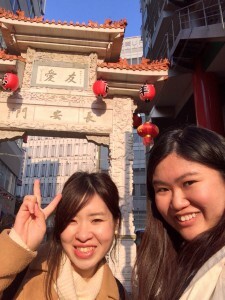 She shows us around beginning with Namba Park and Namba City since these places are the nearest to our Hotel. She was very patient and easy to to talk to. We stopped at a Sushi restaurant and Ms Hiko was very obliging in helping us to choose the right menu since we are vegetarians.Altogether we spent around 3 hours with her guiding us around Shisaibashi-suji, Kuromon-ichiba. Despite that we think we can manage the area by ourselves, yet with her around made things much easier as she is also our “translator” during our shopping spree. 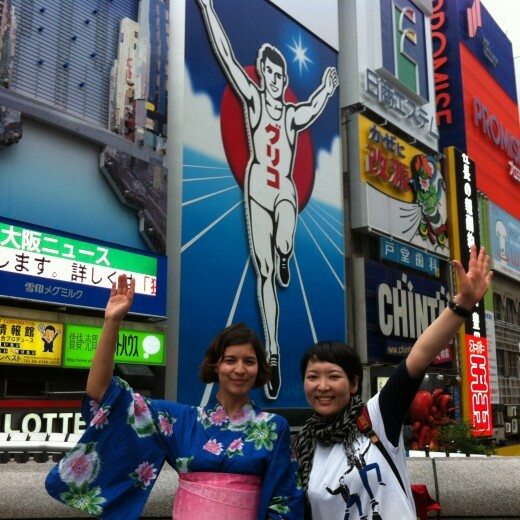 Hello, we would like to thank you for arranging as Hello gentle staff of Visit Kansai! Our experience with Yukina was very funny and interesting! We enjoy very much the day together and she was very available and cute! I will be delighted to share my experience. 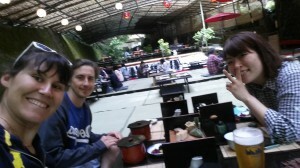 I met Taka, as agreed, in my hotel on 22nd of March 2014 at 10.30am; He is a 24yo boy very kind, friendly and polite. We start our tour at Osaka Castle visiting it. His information about it where very complete and interesting. Then we have visited the “Museum of housing and living”, the shopping area “Shinsekai”, the “Tsutenkaku Tower”, have eaten “Okonomiyaki” e i “Takoyaki”. 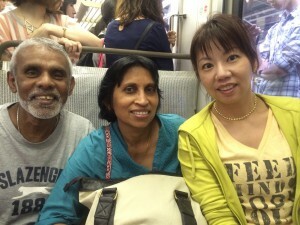 In the late afternoon, a boat tour with “Osaka river cruise” has completed the sightseeing tour. 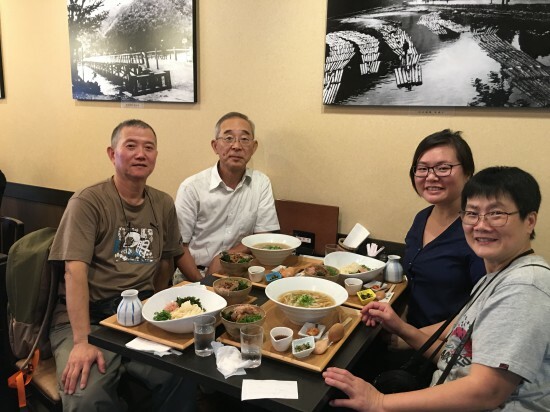 We would like to send our fondest aloha to Kazuko Ozawa and thank her for making our visit to Osaka and Kyoto so memorable. 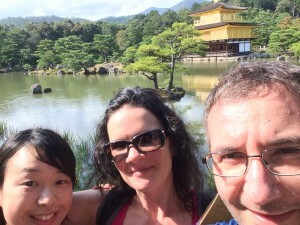 It was our first trip to Japan, my wife and I were not that familiar with train stations and the transportation systems, we had some anxiety and feared getting lost in the train stations and not being able to get to the correct connecting platform in time. Arriving on the Shinkansen at Shin-Osaka Station from Hiroshima, instead of meeting us at Osaka Station, Kaz met us at the arriving platform at Shin-Osaka. Making it so much easier for us, took us to our hotel with our hotel shuttle. Then taught us to use the different train lines and subway. We arrived in Osaka in the late afternoon on Sunday, March 31st, 2013, Cherry Blossoms were in full bloom, and Osaka Castle was open that night. It was a beautiful experience made more wonderful because we were able share this time with a Kaz. 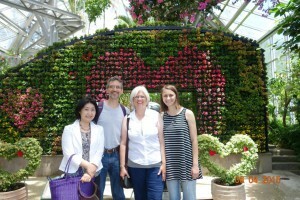 We would like to give a very warm thank you to Kai for his time with us in the Kansai region. 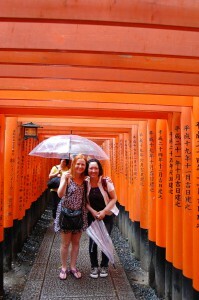 There is so much to do we covered two cities in two days which was Osaka and Kyoto. Kai optimized our time and did his homework for our trip I was pleasantly surprised when we went to the Douguyasuji shopping strip in Osaka which is full of cooking stuff-everything you want for the kitchen. We covered other spots in Osaka like Dotombori and Osaka castle and one heck of a fantastic aquarium. 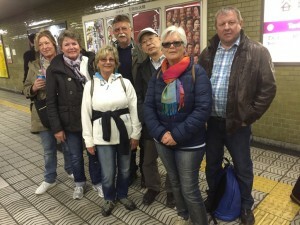 We loved the subway system in Osaka and got to ride on various trains throughout the day. 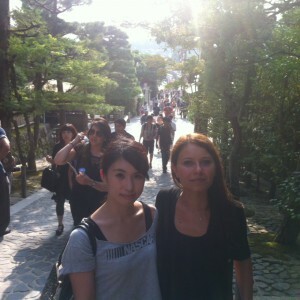 On our day in Kyoto we went to various destinations. My wife was interested in a certain type of handbag made only in Kyoto, it was unique and Kai knew where to go. We covered other areas like the Nishiki markets, Gion corner and a wonderful antique store where my wife bought a set of antique plates. We are now planning our next trip to Japan. 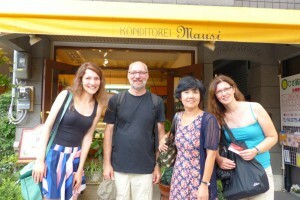 We met Kai in Kyoto on the 17th of July for Gion matsuri.Before that day, we exchanged lot of mails for the organisation. 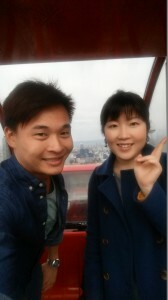 Kai is really kind, proposing lot of activities and doing is best so that I can enjoy our day together. And I did. We saw the big parade, visited temples, had a great lunge near Gion. We laugh a lot. I asked questions about Japan and other stuffs and got answers, I’m really pleased. I’m sorry my poor english can’t reflect how nice Kai is. 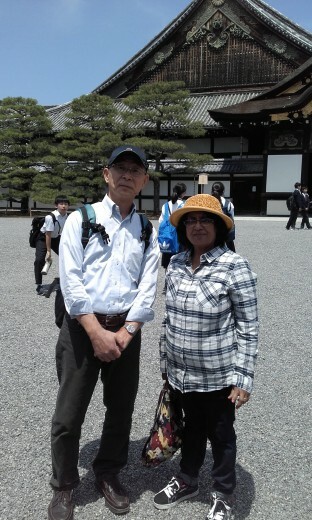 Mr. Norihiro Hamada accompanied us one Saturday to the different sights in Kyoto last June. We communicated before the trip and settled on an itinerary workable with our schedule. He arranged everything — including the reservation to the tea ceremony. He was very accommodating, honest, patient, and polite. We actually enjoyed asking him questions about various things — from food, to language, to Japanese history. He tried his best to effectively translate for us and answer our questions the best way he could (sometimes, even with a touch of humor.) It helped that he speaks English well. We traveled with my mother who is almost 70. He assisted her during long walks, which we really appreciate. All in all, we were lucky to have been guided by Nori. 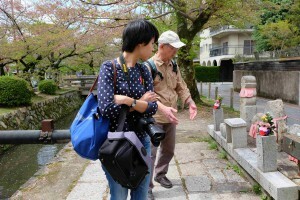 He is inspiring as well— although we learned that he has a very good full time job, he actually devotes time to be a volunteer guide to tourists like us so that we can appreciate their culture and history more. 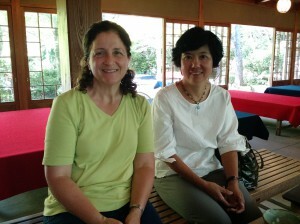 We had the pleasure of visiting Nara and Miwa Mountain on Saturday, March 10th. 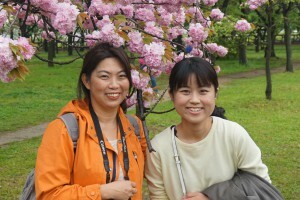 Our guide for this trip was Eriko Inagaki. 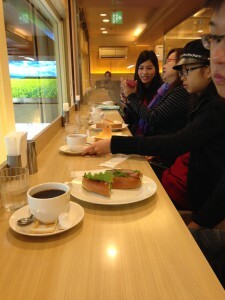 Eriko was very punctual, as well as thoughtful and thorough in preparing our day experience. 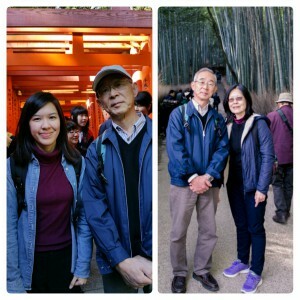 She suggested hiking on Miwa mountain which fit perfectly with our interests in the outdoors. 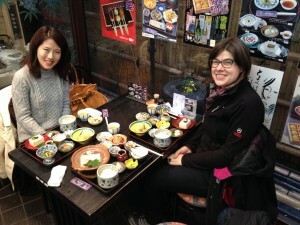 She selected a restaurant specializing in local cuisine which was delightful and reasonably prized. Our visit to Nara was also equally fun. 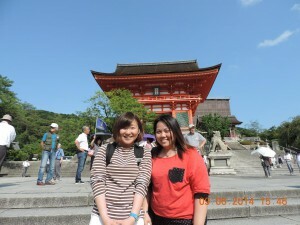 Eriko had an excellent fund of knowledge when visiting the historical sites.